Those who lived in winter temperatures below zero would know how important fermented foods are in winter. I believe there are still many regions where fresh produce is not available during the snowy winter. Fermentation is a way of preserving. Now, even in a warm region like Australia we recognise the importance of the healthy good micro-organisms that are developed in the fermented foods. A healthy gut and well-functioning digestion are fundamental to our overall well-being. Drinking Kefir was such a normal thing in my childhood! Now it is really interesting to witness the growing popularity of the Kefir drink around the world. Kefir originated in Georgia. We were taught that Georgians live long lives because they live in the mountains. Maybe Kefir also contributes to the longevity of their lives? There are other special dairy products that have been invented, maybe those will become known too. There are two popular fermented dairy drinks in Kazakhstan that I know of: Kumys is made by fermenting horse milk and Kozhe is made of fermented barley and low-fat milk. Both are an acquired taste but very pleasant once you get used to them. 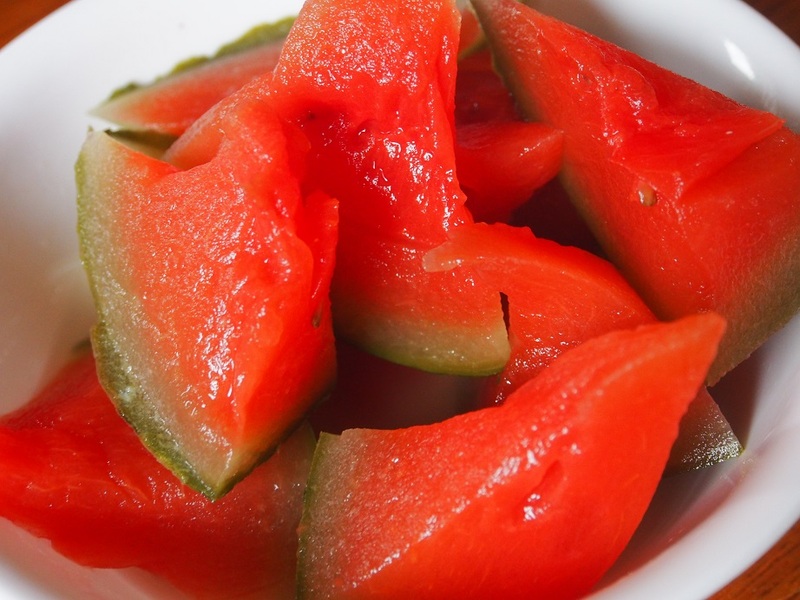 One of my favourite fermented foods is watermelon. There are not many people I know who like it. First, you need to make a brine from 1 litre of boiling water, 1-2 tablespoons of sugar and 1-2 tablespoons of cooking salt depending on the sweetness of the produce and your preference. Second, place your vegetables in the jar. The best companions are dill, parsley, raw fresh garlic, clove and coriander seeds. If you choose any of these just put them along with your vegetables in the jar. Third, cool the brine down to approximately 70C. And last, pour the brine over the vegetables in the jar and cover it with a towel. You will see when the product is ready by tasting the brine and visually you will notice that no more gas is produced from fermentation. Store in the refrigerator. Fermented cabbage was one of the most popular ‘salads’ and salad components during the cold winters in Eastern Europe. Below is a photo where I was captured preparing cabbage in 2004, as my husband found it hilarious that I was ‘salting’ cabbage in Australia where we can buy all possible vegetables all year round. 5 litres of fermented cabbage. 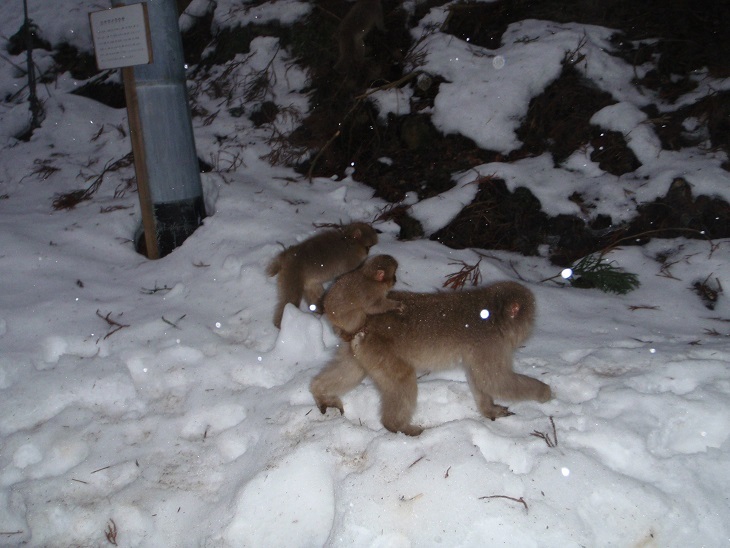 Jan 2004. After reading a few research articles I am now understanding that the fermentation process is a really fascinating one. Every product has its own fermentation with different stages of increasing and reducing fungal and moulds, also concurrent growth of multiple good bacteria. It might be important to find out how many days a specific product takes to ferment and when it is the best to be consumed. To slow down the fermentation you just need to keep the product at the low temperature. 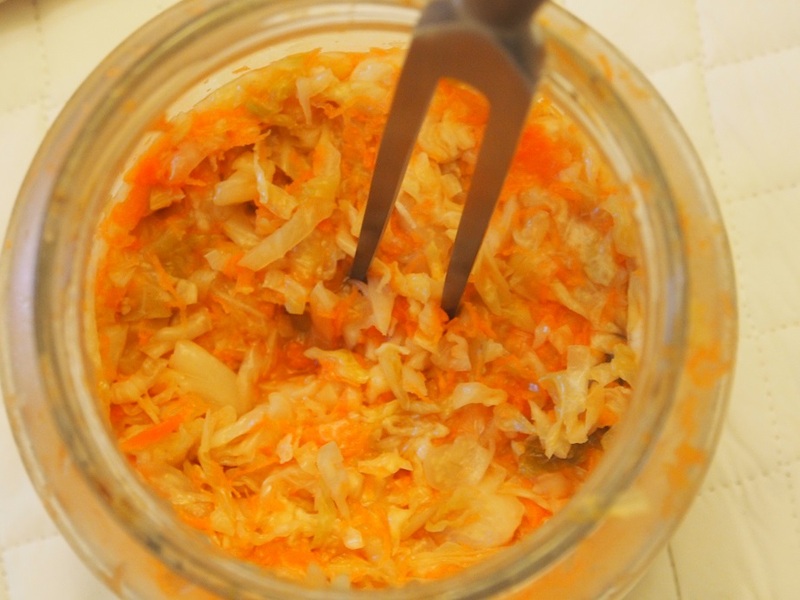 To make fermented cabbage you just need a good jar, white cabbage, carrots and cooking salt. Combine shredded cabbage and grated carrots in a large bowl, add salt and use your hands to squeeze and press thoroughly. As soon as you see the juices separating, you should stop here as the cabbage will be crunchy. However, if you continue to squeeze the juices it will be soft and look like it’s been cooked. I personally like the crunchy version as it looks nicer and that way the fermented cabbage is sweeter. You need to store the jar at room temperature for about 3-5 days. The juices will raise on the first or second day depending on the room temperature. You need to punch the content in the jar with something long and sharp to release gas and settle the juice back into the cabbage. You can try the cabbage every day after the juice stops raising and see when it tastes the best for you. The taste should be sour sweet and not fizzy. You can serve it as it is or with finely sliced shallots and oil. This cabbage can also be used in the winter salads. If you combine this cabbage with diced cucumber, boil-cooked beetroot and potato, onion, and canned green peas- you will get a beautiful salad called Russian Vinaigrette. I learnt that basically you can ferment anything. The good news is if research was trying to identify or quantify the changes in the product after fermentation, it consistently made positive conclusions. Two examples are below. Very informative and nice to read post, Janna! I’ve already been throught many of your recipes these past few days and I like all of them. I have never tried making fermented cabbage but I’ve been making my own milk kefir for a while now and I love it. I’ll give the cabbage a go, I’ve tried some that a friend makes and it’s yummy. Thanks a lot for sharing all these inspiring recipes with us. Hope to see you again soon.